As noted on DaringFireball.net, Apple's popular Remote iPhone application adds a useful and unpublicized feature to your Apple TV - a keyboard. The Remote App [App Store] is a free download from the App Store and runs on both the iPhone and iPod Touch. It adds remote control capabilities for both iTunes and your Apple TV through your local Wi-Fi network connection. For the Apple TV, it acts primarily as a media browser, allowing you to browse and playback both music and video. 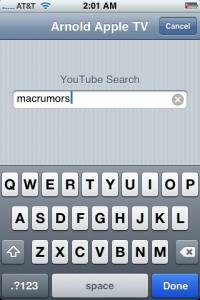 However, if you navigate to YouTube Search or iTunes Store search on your Apple TV itself, this keyboard will appear on your iPhone or iPod Touch and allow you to wireless type in your search terms. This is a much nicer alternative than selecting letters individually with your television remote. Apple released the Remote App as a free app alongside the iTunes App Store. Apple announced that over 10 million apps had been downloaded during the first weekend after the App Store launch.